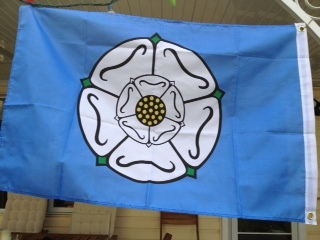 Happy Yorkshire Day to all the Yorkshire folks, Tykes abroad (like me in Canada) and offcumdens, that is, those born outside the County, that love something about the Broad Acres. Here are ten things you might do and enjoy today to celebrate Yorkshire, its people and customs. 1. Wear the white rose, the county emblem. Not to be confused with the red rose of Lancashire or the Wild Rose of Alberta (but see below on celebratory drinks). 2. Make and eat some Yorkshire puddings….recipe is here, make sure the fat is hot and keep the oven door closed! This is part of my dinner plans this evening, served up with a bit o’ Alberta beef from the BBQ. 3. Have a celebratory drink of some good Yorkshire Ale. The best of the best to my mind (and many Championship judges) is Timothy Taylor’s. If you can’t find a pint o’ Tims there are many more to choose from. In Calgary, I recommend an IPA from the Wild Rose Brewery or Last Best or Show Pony (an excellent pale ale fit for long sessions) which are all brewed right here in CowTown. 4. Have a read of some good Yorkshire literature. Maybe one from one o’ them thar Bronte sisters such as Wuthering Heights (Emily’s only novel published in 1847 and amongst the greatest novels of passion in the English language and based around the farms and moors of the West Riding). 5. If you are short of reading time, and in need of a laugh, watch some old Monty Python on YouTube …..Emily’s portrayal of Cathy and Heathcliff is graphically depicted (in semaphore) or you could check out the Four Yorkshiremen sketch. 6. Listen to some music from Yorkshire…Brighouse and Rastrick Brass Band playing the Floral Dance or summat like that is very traditional, or go more modern with a tune from Yorkshire artists such as The Arctic Monkeys (Sheffield area) or Kaiser Chiefs (Leeds area) or maybe Ed Sheeran who was born in Halifax. 7. Sing a song! Top o’t list for Yorkshire Day is, of course, the anthem Ilkley Moor Baht ‘At. For variation, check out Brian Blessed’s rap version. 8 . Go watch a rerun of a film like Brassed Off or The Full Monty for dark humour about the decline of the mining and steel industries in Yorkshire. The aforesaid Wuthering Heights or sister Charlotte’s Jane Eyre offer plenty of versions to choose from over the years. One of my own old favourites is The Railway Children, directed by Lionel Jeffries in 1970 and filmed in my home village, Haworth, and along the Keighley & Worth Valley Preservation Society railway line (Caution: playing on railway lines is to be discouraged!) Alternatively a TV series (and film) like All Creatures Great and Small, which features VET’s on the North York Moors/Yorkshire Dales. 9. Back to some food ideas, you can’t go too wrong with a slice of Wensleydale cheese, just like Wallace and Grommit enjoy with their crackers, or do it my way, with a nice piece of apple pie. 10. Unless you are currently living in Yorkshire, in which case you can tick this one off, book a holiday to visit Yorkshire. Cycling is one way to get around if you’re keen and fit. In 2014, The Tour de France (@letouryorkshire) ran its first two stages from and between Leeds, Harrogate, York and Sheffield, including through Haworth, where I was born and bred. Hi blogger, i must say you have high quality posts here. Your blog should go viral.